Alzheimer's disease (AD), the commonest cause of dementia, is estimated to affect over 400 000 people in the UK,1 with numbers around the world set to rise dramatically as the population ages. Distinguishing AD from other causes of cognitive impairment is important for numerous reasons, including provision of appropriate care and access to medications. As and when disease-modifying therapies become available, the priority for earlier and more accurate diagnosis will increase still further. For the purposes of this article and with the aim of providing a practical guide to the differential diagnosis of AD, we will first consider the ‘typical’ clinical presentation of late-onset, sporadic, amnestic AD, before reviewing other conditions that can mimic these symptoms. Turning then to the chameleons, we will discuss some atypical or unusual clinical presentations that can be associated with histologically proven AD. Although, as with any disease, no two individuals with AD are alike, several core features are sufficiently common to qualify as ‘typical’. Affected individuals are usually elderly: the overall prevalence of dementia closely relates to that of AD, its commonest cause. The prevalence roughly doubles every 5 years, from ∼1% in 65-year-olds to 69-year-olds to 30%+ in those aged 90 years or more.1 AD is typically sporadic, that is, the vast majority of patients do not have a family history consistent with autosomal-dominant inheritance. The cognitive deficits of AD are typically insidious rather than rapid in onset, with early problems relating to subtle changes in confidence and the emergence of problems with episodic memory, for example, forgetting appointments and telephone conversations. As the disease progresses, patients develop problems in other cognitive domains including anomia; problems with route finding and orientation; problems with arithmetic (eg, handling money) and spelling; and difficulties with multitasking and problem-solving. Whereas a degree of social withdrawal and depression are common, patients with mild–moderate AD typically have a preserved social façade, without major personality change. Early in the disease course the physical examination is typically normal, although later myoclonus is fairly common. The disease typically slowly and relentlessly progresses over several years, with concomitant impairments in activities of daily living requiring increasing assistance, until the patient eventually becomes dependent. Death occurs after a median of ∼7 years,6 although with considerable variation between individuals. 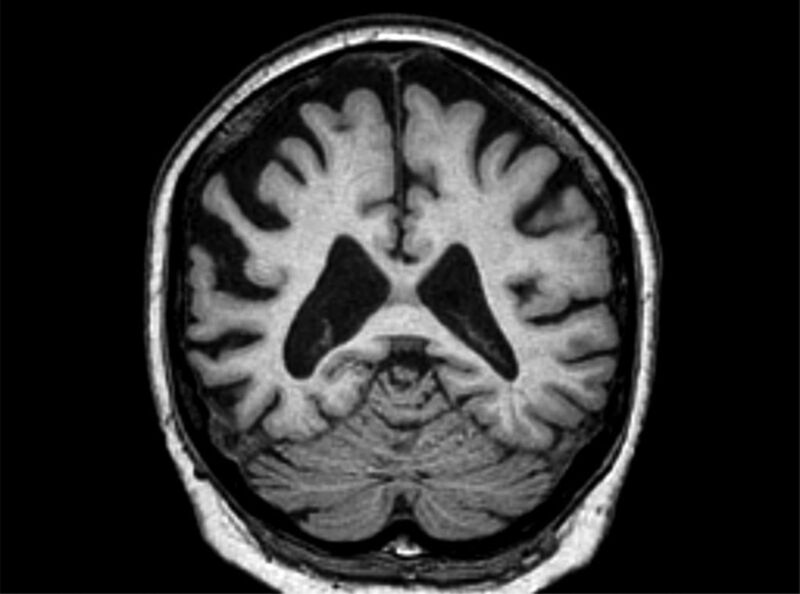 Currently, no investigations are required to reach a diagnosis of AD, although all patients should have blood testing and structural brain imaging as part of the diagnostic work-up.7 Brain imaging may be normal in the very early stages, but progressive atrophy, usually symmetrical and particularly involving medial temporal lobe structures, is typical. CSF examination is not routinely performed, but would be expected to be acellular and without oligoclonal bands. Where available, testing for CSF β-amyloid (Aβ)1–42 (low) and tau or phosphorylated tau (raised) supports a diagnosis of AD.8 Although not currently part of routine clinical practice, functional imaging using single photon emission computed tomography (SPECT) or glucose PET typically reveals temporo-parietal hypometabolism.9 Amyloid deposition can be imaged in vivo using PET combined with 11C PIB (Pittsburgh Compound B) or a number of relatively new 18F amyloid tracers,10 one of which (Florbetapir, or Amyvid) was recently licensed for clinical use in the USA. Mimics: what's not typical AD, but looks like it? In view of its remarkably high prevalence in the elderly, AD is often the ‘default’ dementia diagnosis. While many conditions superficially resemble AD, few are really true mimics (table 1). Here we adopt a pragmatic position, and focus on conditions that might mislead an experienced general neurologist. As this group includes several potentially reversible entities, accurate diagnosis is especially important. Often the most difficult diagnostic challenge arises when a patient presents with very mild cognitive complaints, which could potentially represent early AD, but might also reflect the effects of ageing or anxiety. The situation is further complicated by evidence suggesting that older individuals with concerns about memory but no objective impairment (so-called worried well) may have a higher incidence of subsequent conversion to AD.11 In our experience, cognitive symptoms more suggestive of anxiety than degeneration include concerns about normal phenomena (eg, not remembering why one has entered a room or going on ‘automatic pilot’ when driving) or reports of dramatic worsening with stressors despite normal function at other times. Obtaining a collateral history is paramount, and may be very revealing.12 Often, the anxious patient is more concerned than the informant, whereas the opposite is more typical in AD. There is some evidence to suggest that individuals asked to bring a collateral source to a consultation but who attend alone are less likely to have an organic cause for their symptoms.13 A further pointer to anxiety may be impaired performance on bedside cognitive testing despite demonstrably competent and unchanged performance in everyday life. On the contrary, deteriorating occupational or social confidence (particularly when corroborated by others) and early loss of topographical or visuospatial awareness are red flags for AD even in an otherwise competent individual. The extent to which it is appropriate to investigate the ‘worried well’ depends on the situation. Formal neuropsychometry is very helpful in determining whether there are objective focal impairments, which when present should prompt further investigation. In case of doubt, interval assessment and investigation may help to determine whether there has been objective evidence for decline, as would be expected in a neurodegenerative condition. The pattern of cognitive impairment associated with depression may overlap with that seen in the worried well, and is often qualitatively different from that seen in AD. Impaired concentration and attention is often prominent, leading to poor registration of information: where patients do attend to the task in hand, performance may improve dramatically. Direct questioning may reveal biological symptoms of depression, and it may be helpful to ask specifically about current and past stressors, and for the presence of ruminations and impaired concentration. Depression, however, may complicate existing AD, and there is a growing body of evidence to suggest that depression may either be a risk factor or an early manifestation of AD, consistent with the dysfunction of limbic structures predicted on neuroanatomical grounds. We are particularly cautious about attributing cognitive concerns to depression in older individuals particularly without obvious stressors or previous psychiatric illness. In such cases we investigate, treat the depression and have a low threshold for keeping the patient under review until the situation is clarified. It is important to exclude metabolic conditions that may influence cognition, and we routinely check glucose, B12, folate and thyroid function in all patients. Although it is not uncommon to detect abnormalities in these variables, particularly in the elderly, it is rare in our practice for these conditions to be profound, or on careful questioning closely to mimic AD; there is ongoing debate as to whether certain vitamin deficiencies may be risk factors for AD. It is important to correct/treat any such abnormalities, and in selected cases this can give quite dramatic improvements.14 However, we would usually be cautious about attributing progressive episodic memory impairment or other focal deficits to metabolic derangements, particularly with imaging evidence for atrophy. Although several acute infections—notably herpes simplex encephalitis—may lead to memory impairments that in the chronic state might resemble those of AD, infection is not usually a realistic mimic of AD, either on history or on cognitive examination. Primary HIV infection or syphilis can undoubtedly cause cognitive impairment, but we have not seen either truly mimicking AD clinically, and both can be excluded through appropriate investigations. The spectrum of autoimmune disorders affecting the central nervous system has expanded dramatically over the last decade. Several antibodies can cause paraneoplastic or non-paraneoplastic limbic encephalopathies (there have been recent reviews on both in this journal).16 ,17 These conditions are usually distinct from typical AD, being rapid and associated with acute encephalopathy, seizures and/or movement disorders, and often signal change on MRI. Patients who have recovered from limbic encephalitis—particularly voltage-gated potassium channel complex receptor antibody (LGi1 (leucine-rich glioma inactivated 1 gene)) type—may be left with a dense amnesia and focal hippocampal atrophy on MRI, which superficially may resemble AD. However, the type of amnesia in such patients is usually different from that seen in AD, taking the form of a dense and often temporally ungraded loss of memory for events for many years preceding the acute illness.18 However, the spectrum of recognised phenotypes associated with these disorders continues to expand, and there are at least anecdoctal reports of elderly patients with a syndrome of insidiously progressive amnesia and hippocampal atrophy closely resembling AD; and a recent study demonstrated synaptic autoimmunity in a proportion of patients with NMDA receptor antibodies and unexplained slowly progressive cognitive impairment.19 Pragmatically, where the differential diagnosis includes autoimmunity and AD, clinicians should consider testing for neuronal-specific antibodies and/or assessing the CSF for AD markers. Epilepsy and AD are both very common and not infrequently coexist. However, seizures do not typically occur as a consequence of AD pathology until the disease is advanced. Medial temporal lobe seizures can lead to significant memory impairment—transient epileptiform amnesia (TEA)—in the absence of other seizure-related phenomena. Very frequent, subclinical seizure activity can produce a clinical syndrome reminiscent of AD. Clinical features that should raise suspicion of TEA include periods of dense amnesia for distinct events (eg holidays) with relative preservation at other times, amounting to ‘gaps’ in the memory record; worsening after sleep; and a history of olfactory hallucinations, staring episodes or automatisms suggestive of epileptic activity.23 Prolonged EEG may be required to determine epileptiform activity, and in addition to brain MRI, we have a low threshold for checking VGKC receptor complex and NMDA antibodies (although these are rarely positive) and examining the CSF in such patients. Drugs and alcohol can both cause significant cognitive decline, but neither in isolation produces a clinical syndrome likely to be mistaken for AD. One possible exception is Korsakoff's psychosis where patients have very severe episodic memory impairments, albeit usually without the typical loss of confidence and intellectual blunting that is typical for AD. As well as a history of Wernicke's encephalopathy (if elicited), another potentially useful clinical clue is confabulation, which is common and may be profound in Korsakoff's,24 but at least in our experience, is relatively rare in AD. Obstructive sleep apnoea is not an uncommon cause of memory complaints and referral to memory clinics, and can occasionally mimic the clinical manifestations of AD surprisingly closely. As obstructive sleep apnoea is potentially treatable we routinely ask patients and their partners about sleep and snoring; where it is a possibility sleep studies should be performed. Frontotemporal lobar degeneration (FTLD) comprises a diverse group of disorders with non-AD proteinopathies including tau and TDP-43. FTLD can broadly be divided into behavioural variant frontotemporal dementia (bvFTD); and primary progressive aphasia.25 In keeping with all neurodegenerative diseases, at their most extreme these conditions are phenotypically very distinct from ‘classical’ AD. However, some patients with FTLD pathologies, particularly those with mutations in the tau gene,26 and some patients with TDP-43 pathology—including individuals who go on to develop FTD/motor neurone disease either on a sporadic basis or due to mutations in the recently identified C9orf72 gene 27—can present with an insidious onset of episodic memory impairment, sometimes with focal medial temporal lobe atrophy resembling AD. We have occasionally seen the progressive anomia of early semantic dementia mistaken for episodic memory impairment, and thus AD, though the semantic dementia syndrome (in particular, the early disintegration of verbal and semantic knowledge) is highly distinctive and not a feature of typical AD. In difficult cases, demonstration of amyloid deposition using CSF measures of Aβ1–42 (or in due course, amyloid PET) may help to distinguish AD from non-AD pathologies. Dementia with Lewy bodies (DLB) is the second-most common neurodegenerative cause of later life dementia, and is typically associated with several clinical features that are uncommon in AD. These include significant cognitive fluctuations, motor parkinsonism, hallucinations, REM sleep behaviour disorder and autonomic dysfunction. Consensus clinical criteria, based on these and other features, have high sensitivity and specificity for DLB.28 However, some patients with postmortem-proven DLB have a clinical course dominated by progressive memory impairment without the emergence of any of these features (case vignette 1). MRI may be helpful in distinguishing AD from DLB on a group level with medial temporal lobe structures typically affected relatively selectively early on in AD but relatively preserved in DLB; this is, however, not always useful on an individual patient basis. DLB often shows evidence of nigrostriatal degeneration on dopamine transporter imaging. However, even with investigations, it may not be possible to distinguish AD and DLB during life: in the absence of motor parkinsonism patients may have negative dopamine transporter imaging. As DLB and AD commonly coexist at postmortem, even an AD-like CSF profile does not exclude concomitant DLB pathology. A 74-year-old woman was referred with a 2-year history of progressive problems with episodic memory. On examination, she scored 23/30 on the mini-mental state examination (MMSE), and there was evidence for episodic memory impairment and subtle loss of confidence. The neurological examination was normal. MRI showed mild volume loss involving medial temporal lobe structures. Neuropsychometric testing confirmed generalised intellectual underfunctioning and significant episodic memory impairment. A diagnosis of AD was made and she was started on an acetylcholinesterase inhibitor, which improved her attention and memory. Over the following years she began to get lost, and developed progressive cognitive impairments. Seven years into the course of the disease, the MMSE was 5/30. There were no Parkinsonian signs, significant fluctuations or hallucinations at any stage during the disease. She died 9 years after disease onset. At postmortem examination, the pathological diagnosis was of DLB without significant AD pathology. This case both demonstrates the difficulties of in vivo diagnosis based on clinical phenotype, but also the value of a trial of acetylcholinesterase inhibition—which may be particularly helpful in the context of Lewy body pathology—where AD is possible. Of the large range of other neurodegenerative pathologies, most do not usually produce a phenotype consistent with AD. Exceptions include argyrophilic grain disease or tangle-only dementia, which are currently not reliably diagnosable during life.29 Autosomal-dominant mutations in the prion gene can produce a slowly progressive amnestic syndrome indistinguishable from AD.30 These patients generally have a younger age at onset; the family history, while often informative, may be censored. Very occasionally patients with hippocampal sclerosis can develop a dementia that can be mistaken for AD: whether the hippocampal sclerosis in such cases is occurring on a degenerative, autoimmune, infective or other basis remains unclear.31 Patients with progressive supranuclear palsy often have significant cognitive and behavioural changes which, although usually very different from those seen in AD, are a conceivable mimic. Such cases, although rare, demonstrate the very real difficulties of determining a definitive diagnosis during life and support the use of well-validated, AD-specific biomarkers in unusual or atypical cases. A small although significant proportion of patients with AD present in ways that diverge from the typical pattern outlined above. Young-onset dementia is arbitrarily defined as disease onset below 65 years.32 Of the myriad causes of dementia in this group, AD is still the most common neurodegenerative aetiology. Although some patient with young-onset AD (YOAD) have a disease otherwise indistinguishable from typical, late onset AD, they are more likely to have a non-amnestic phenotype, or autosomal-dominant disease (see below). Patients with otherwise typical YOAD are more likely to have early and sometimes quite prominent myoclonus, which, combined with their young-onset disease, can cause diagnostic confusion. In posterior cortical atrophy (PCA), as the name suggests, the burden of the disease is at least initially focused on the parietal/occipital rather than temporal lobes: this syndrome has recently been reviewed in detail.35 Patients with PCA are typically young (50–65 years), but not exclusively so. Patients often have early anxiety, followed by the emergence of problems centred on combinations of visual processing, praxis, calculation and spelling, with relative preservation of memory, naming and executive function (case vignette 2). Imaging can be normal, but MRI often shows focal posterior atrophy (figure 1) and PET/SPECT hypometabolism. Patients are not infrequently initially dismissed as functional, and/or referred to opticians or ophthalmologists, before a diagnosis is made. Coronal volumetric 1.5 T MRI scan from case vignette 2 shows marked parietal lobe atrophy. The hippocampal volumes were by contrast preserved. A 55-year-old man presented with a 3-year history of progressive problems in several cognitive domains including calculation, spelling, dressing and performing complex tasks. There were no significant problems with memory, or of personality change. On examination, the MMSE was 28/30, and there was finger myoclonus. Bedside and formal neuropsychometric testing showed significant parietal lobe dysfunction with impaired spelling and calculation, and prominent dyspraxia. He could not identify fragment letters. There were mild word-finding difficulties, but episodic memory was relatively spared. The MRI scan showed mild generalised atrophy, with prominent parietal lobe volume loss (Figure 1). There was progressive cognitive impairment over the following years, although significant memory decline was not evident until 7 years after disease onset. He developed seizures 8 years into the course of the disease, and died 1 year later. Postmortem examination of the brain confirmed severe Alzheimer pathology. For some patients with AD, progressive language decline is the presenting feature.36 These cases include those with a fairly specific AD-related syndrome—logopenic aphasia (LPA)—and those with a syndrome overlapping with progressive non-fluent aphasia (PNFA) or, less commonly, semantic dementia (SD). In LPA, speech is typically hesitant, with long word-finding pauses, prominent anomia, reduced digit span, particular difficulty repeating phrases and sentences compared with single words, and the early emergence of associated dominant parietal deficits. Clinically, a minority of patients with a PNFA or SD syndrome have underlying AD pathology. Such cases can closely resemble language cases with the more typical non-AD pathologies. In contrast to typical AD, in language-led syndromes, the MRI scan is more likely to show asymmetrical atrophy; and in SD there is usually strikingly focal involvement of the anterior-dominant temporal lobe. CSF and/or amyloid PET may help to confirm or refute the presence of AD pathology. Early behavioural changes—either disinhibition or apathy—characterise the bvFTD syndrome: while most cases are due to non-AD pathologies, some of these patients have AD at postmortem.37 Prominent episodic memory impairment may be a feature in these cases but no clinical or structural neuroimaging features reliably differentiate AD from non-AD pathologies in the bvFTD spectrum, and this remains one of the most diagnostically challenging of the AD chameleons. CSF and amyloid PET biomarkers may prove decisive but their role is not yet established. While AD is typically slowly progressive, it may be much more rapid, sufficiently so that brain biopsy has been performed in some cases, principally to exclude cerebral vasculitis (case vignette 3).39 Atypical features reported in rapid AD include myoclonus, gait ataxia, extensor plantar responses, hallucinations, aphasia and falls, sometimes sufficient to suggest prion disease.40 In such cases, imaging and CSF studies are particularly valuable. Although the mechanisms are not entirely clear, there is likely to be some overlap between AD, and rare cases of inflammatory cerebral amyloid angiopathy. A 59-year-old woman presented with a 14-month history of progressive memory decline accompanied by myoclonus and generalised tonic–clonic seizures. There was no relevant medical or family history. On examination, she showed severe widespread cognitive impairment, myoclonus and brisk tendon reflexes. Blood screens were normal. Brain MRI showed mild generalised atrophy with no signal abnormalities. An EEG showed multifocal epileptiform changes with a diffuse excess of slow activity. CSF examination showed normal basic constituents and negative oligoclonal bands. A right frontal lobe biopsy, performed to exclude cerebral vasculitis, revealed the features of AD, with no evidence of vascular or other superadded pathology. AD generally presents as a slowly progressive amnestic syndrome in later life, but there are several conditions that can mimic AD; conversely AD can mimic a range of other conditions. The high prior likelihood that an elderly individual with cognitive impairment has AD should not preclude consideration of other causes, and in particular it is always important to consider ‘reversible’ or treatable conditions, even if they are rare. Aside from endogenous variation in the AD phenotype, a further issue (particularly in older patients) is the real possibility of mixed pathology, eg, superadded vascular damage or Lewy body pathology, which may modify the AD phenotype. In many cases, careful history taking and bedside assessment can help to define atypical or unusual cases, but standard investigations—particularly MRI and neuropsychology—can be very useful in assessing the likelihood of AD versus other conditions. Pragmatically, while we advocate attempting to arrive at a diagnosis with reasonable certainty, we have a low threshold for empirical trials of treatment for AD in patients with an AD-like phenotype or one of the canonical chameleon syndromes (particularly PCA and LPA). This situation will, however, be transformed by the advent of targeted disease-modifying therapies with the potential both for substantial benefit but also side effects. This prospect lends impetus to the search for new and robust in vivo biomarkers of AD pathology: such biomarkers are already beginning to revolutionise differential diagnosis, and will continue to do so as they are more widely adopted. We thank Lorna Harper for the help with preparation of brain images. The Dementia Research Centre is an Alzheimer's Research UK Coordinating Centre. This paper was reviewed by Andrew Budson, Boston, USA, and Robin Corkill, Cardiff, UK.
. Accuracy of the clinical diagnosis of Alzheimer disease at national institute on aging Alzheimer disease centers, 2005–2010. J Neuropathol Exp Neurol 2012;71:266–73.
. Neuropathologically defined subtypes of Alzheimer's disease with distinct clinical characteristics: a retrospective study. Lancet Neurol 2011;10:785–96.
. Clinical diagnosis of Alzheimer's disease: report of the NINCDS-ADRDA Work Group under the auspices of Department of Health and Human Services Task Force on Alzheimer's disease. Neurology 1984;34:939–44.
. New diagnostic criteria for Alzheimer's disease and mild cognitive impairment for the practical neurologist. Pract Neurol 2012;12:88–96.
. Survival following dementia onset: Alzheimer's disease and vascular dementia. J Neurol Sci 2005;229–230:43–9.
. Practice parameter: diagnosis of dementia (an evidence-based review). Report of the Quality Standards Subcommittee of the American Academy of Neurology. Neurology 2001;56:1143–53.
. Cerebrospinal fluid and plasma biomarkers in Alzheimer disease. Nat Rev Neurol 2010;6:131–44.
. Perfusion SPECT and FDG-PET. Int Psychogeriatr 2011;23(Suppl 2):S25–31.
. Amyloid imaging as a biomarker for cerebral β-amyloidosis and risk prediction for Alzheimer dementia. Neurobiol Aging 2011;32:S20–36.
. Prediction of dementia by subjective memory impairment: effects of severity and temporal association with cognitive impairment. Arch Gen Psychiatry 2010;67:414–22.
. Symptoms of memory loss as predictors of cognitive impairment? The use and reliability of memory ratings in a clinic population. Alzheimer Dis Assoc Disord 2007;21:101–6.
. ‘Attended alone’ sign: validity and reliability for the exclusion of dementia. Age Ageing 2009;38:476–8.
. Cognitive profile in dementia associated with vitamin B12 deficiency due to pernicious anaemia. J Neurol 1999;246:317–19.
. Lack of shunt response in suspected idiopathic normal pressure hydrocephalus with Alzheimer disease pathology. Ann Neurol 2010;68:535–40.
. Autoantibody testing in encephalopathies. Pract Neurol 2012;12:4–13.
. Which antibody and which cancer in which paraneoplastic syndromes? Pract Neurol 2010;10:260–70.
. Extensive and temporally ungraded retrograde amnesia in encephalitis associated with antibodies to voltage-gated potassium channels. Arch Neurol 2007;64:404–10.
. IgA NMDA receptor antibodies are markers of synaptic immunity in slow cognitive impairment. Neurology 2012;78:1743–53.
. Development of selective verbal memory impairment secondary to a left thalamic infarct: a longitudinal case study. J Neurol Neurosurg Psychiatr 2003;74:255–7.
. Brain microbleeds and Alzheimer's disease: innocent observation or key player? Brain 2011;134:335–44.
. Transient epileptic amnesia. Curr Opin Neurol 2010;23:610–16.
. The Korsakoff syndrome: clinical aspects, psychology and treatment. Alcohol 2009;44:148–54.
. Clinical and neuroanatomical signatures of tissue pathology in frontotemporal lobar degeneration. Brain 2011;134:2565–81.
. Dementia mimicking Alzheimer's disease owing to a tau mutation: CSF and PET findings. Alzheimer Dis Assoc Disord 2010;24:303–7.
. Frontotemporal dementia with the C9ORF72 hexanucleotide repeat expansion: clinical, neuroanatomical and neuropathological features. Brain 2012;135:736–50.
. Consensus guidelines for the clinical and pathologic diagnosis of dementia with Lewy bodies (DLB): report of the Consortium on DLB International Workshop. J Alzheimer's Dis 2006;9:417–23.
. Argyrophilic grain disease. Brain 2008;131:1416–32.
. Inherited prion disease with six octapeptide repeat insertional mutation—molecular analysis of phenotypic heterogeneity. Brain 2006;	129:2297–317.
. Hippocampal sclerosis dementia differs from hippocampal sclerosis in frontal lobe degeneration. Acta Neuropathol 2007;113:245–52.
. Correlating familial Alzheimer's disease gene mutations with clinical phenotype. Biomark Med 2010;4:99–112.
. Rare variants in APP, PSEN1 and PSEN2 increase risk for AD in late-onset Alzheimer's disease families. PLoS One 2012;	7:e31039.
. Posterior cortical atrophy. Lancet Neurol 2012;11:170–8.
. Primary progressive aphasia: defining genetic and pathological subtypes. Curr Alzheimer Res 2011;8:266–72.
. Clinical and pathological evidence for a frontal variant of Alzheimer disease. Arch Neurol 1999;56:1233–9.
. Brain biopsy in dementia. Brain 2005;128:2016–25.
. Rapidly progressive Alzheimer's disease: a multicenter update. J Alzheimers Dis 2012;30:7516. Contributors Both authors contributed to the writing of this paper. Funding This work was supported by the National Institute for Health Research (NIHR) Biomedical Research unit in Dementia based at University College London Hospitals (UCLH) and University College London (UCL). The views expressed by the authors are not necessarily those of the NHS, NIHR or the Department of Health. Dr Schott is a HEFCE Clinical Senior Lecturer and receives funding from Alzheimer's Research UK and the Alzheimer's Society. Dr Warren is in receipt of a Wellcome Trust Senior Clinical Fellowship (Grant No. 091673/Z/10/Z). Provenance and peer review Commissioned, externally reviewed.